A large new Northwestern Medicine study upends our understanding of vitamin E and ties the increasing consumption of supposedly healthy vitamin E-rich oils – canola, soybean and corn – to the rising incidence of lung inflammation and, possibly, asthma. The new study shows drastically different health effects of vitamin E depending on its form. The form of vitamin E called gamma-tocopherol in the ubiquitous soybean, corn and canola oils is associated with decreased lung function in humans, the study reports. The other form of vitamin E, alpha-tocopherol, which is found in olive and sunflower oils, does the opposite. It’s associated with better lung function. 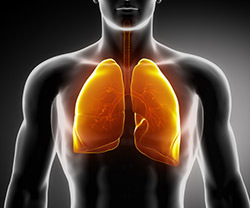 “Considering the rate of affected people we found in this study, there could be 4.5 million individuals in the U.S. with reduced lung function as a result of their high gamma-tocopherol consumption,” said senior author Joan Cook-Mills, PhD, an associate professor of Medicine in Allergy/Immunology at Northwestern University Feinberg School of Medicine. Rates of asthma in the U.S. have been climbing in the last 40 years, coinciding with a switch in U.S. diets from lard and butter to soybean, canola and corn oils, which were thought to be healthier for the heart. Looking at other countries’ rates of asthma, Cook-Mills said those with significantly lower rates of asthma have diets high in olive and sunflower oils. The study examined 4,526 individuals from the Coronary Artery Risk Development in Young Adults Study (CARDIA). Cook-Mills had done previous allergy research in mice showing alpha-tocopherol decreased lung inflammation, protecting healthy lung function and gamma-tocopherol increased lung inflammation and airway hyper-responsiveness, a characteristic of asthma. She hypothesized that they might have similar effects in humans. Cook-Mills examined the CARDIA results for individuals’ lung function tests at four intervals from baseline to 20 years and the type of tocopherol levels in their blood plasma at three intervals from baseline to 15 years. She found that a high level of gamma-tocopherol, 10 micromolar in the blood plasma, was associated with a 10 to 17 percent reduction in lung function. Micromolar is a measure of the amount of gamma-tocopherol per liter volume of blood plasma. In 2012 research, she identified a mechanism for gamma-tocopherol increasing lung inflammation: protein kinase C-alpha, which binds to both forms of vitamin E. Alpha-tocopherol inhibits the action of the protein, and gamma-tocopherol increases the action of the protein. Other Northwestern authors on the paper include Michelle Marchese; Rajesh Kumar, MD; Kiang Liu, PhD; Laura Colangelo and Pedro Avila, MD.